Precise fluid control: the Xaar 1003 AMp is designed for applications where tight control of fluid deposition is required. It can repeatedly jet fluid volumes tuned to a sub-drop range of between 1 and 3 pL with an extremely high degree of accuracy. Unrivalled reliability: the Xaar 1003 AMp printhead is designed to deliver maximum production uptime with minimum operator intervention which ensures high production output and a fast return on investment. Extreme versatility: the design of the Xaar 1003 AMp enables the use of a wide range of fluids and configuration options. This is complemented by Xaar’s systems components which are optimised for the Xaar 1003 product family and ensure simple and rapid integration. Please fill in this form and a Xaar representative will get back to you. 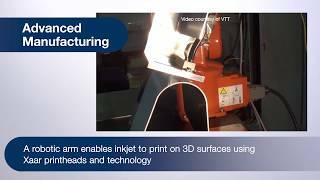 Xaar’s Advanced Manufacturing printheads are designed to allow our partners to develop customised manufacturing solutions based on a proven high performance industrial inkjet platform. The Xaar 1003 AMp is the first introduction to this range of market-leading piezoelectric drop-on-demand printheads for Advanced Manufacturing applications. The Xaar 1003 AMp is perfect for very small drop fluid deposition on an industrial scale and is capable of consistently jetting droplets as small as 1 pL for the production of fine features, patterns and coatings. The combination of highly accurate, very small drops and unrivalled reliability enables the industrialisation of advanced manufacturing processes in sectors such as display, PCB, semiconductors and photovoltaics. Many applications require tight regulation of coating thicknesses, precise patterns and management of substrate surface characteristics. The Xaar 1003 AMp combines highly accurate drop placement, consistent drop volume and high frequency jetting with variable drop size capability to deliver the precise fluid control essential for these processes. Delivering the precise fluid control required for advanced manufacturing processes, the Xaar 1003 AMx combines very accurate drop placement, consistent drop volume and high frequency jetting. The Xaar Midas Ink Supply System is a compact fluid supply system for OEMs looking for a fast time-to-market and therefore low development costs. Robust and easy to integrate, it is ideal for full production as well as prototype systems.